The British Virgin Islands are in the Caribbean, between the Caribbean Sea and the North Atlantic Ocean, east of Puerto Rico. 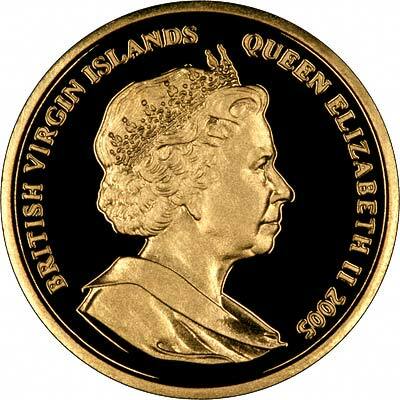 The British Virgin Islands issued its own coins for the first time in 1973 to celebrate the tercentenary (300th anniversary) of its constitutional government, and the first gold coins followed in 1975. 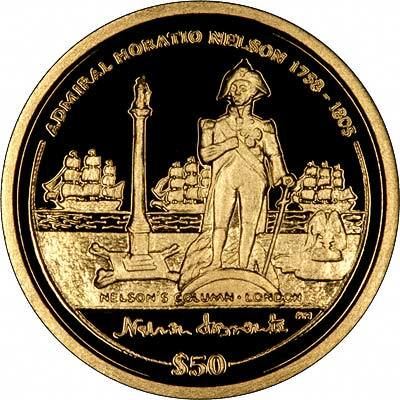 In 2005, to celebrate the bicentenary of the Battle of Trafalgar, and the death of Nelson, the British Virgin Islands have chosen to issue an unusual gold coin. Not only does it bear a portrait of the great man himself, but also a view of Nelson's column in Trafalgar Square. London. The most unusual feature of this coin is that it has a copper inlay forming the Column, and this is made of copper from Nelson's flagship, The Victory. There are some who would consider this somewhat gimmicky, but nevertheless it does make this coin different from all others. Another slightly unusual feature is that the coin cannot be purchased on its own, but only as part of a specially boxed set, with a 2005 Manx Silver Proof Nelson Crown, and a book detailing the process by which the coins received their copper inlay. The Manx Crown also has a copper inlay strip bearing Nelson's signature, so it is quite likely that a collector wanting the gold coin would also want the silver coin, and the box and book make this quite a collector's item. To commemorate the bicentenary of the Battle of Trafalgar and the death of a great British naval hero, Vice Admiral Horatio Nelson, the Governments of the British Virgin Islands and the Isle Of Man have approved the release of these two unique coins each bearing a piece of authenticated copper from 'HMS Victory'; the legendary ship upon which Nelson led the battle and upon which he died after hearing that the British had been victorious against Napoleon's fleet. When Pobjoy Mint became aware that the copper from 'HMS Victory' was available it applied for the rights to obtain some of the copper and use it in these superb coins produced under the auspices of the National Maritime Museum, London, which has granted Pobjoy Mint access and permission to use the signature that Nelson adopted when he became the Duke of Bronte. The design on this magnificent gold coin from the British Virgin Islands features a full portrait of Nelson, Nelson's column, highlighted in copper and the fountain in Trafalgar Square with three ships in the background referring to his life on the seas. Nelson's signature is shown beneath with the value of $125 at the base. The wording 'Admiral Horatio Nelson 1758-1805' is in the surround. The exceptional silver coin from the Isle of Man depicts The Battle of Trafalgar, showing the 'Victory' cutting through the French Line. Nelson's signature is shown beneath the image, highlighted with the copper, with the date of the battle underneath. The wording in the surround reads 'The Bi-Centenary of the Battle of Trafalgar' with the value of 1 Crown at the base. The gold coin will only be available as part of a set with the silver coin. They are both presented in a handmade box with a detailed booklet explaining and showing the whole process that the copper followed and the certificate of authenticity. This extremely collectable set also includes a piece of copper from HMS Victory as it was when it was removed from the ship. Only 999 of these amazing sets exist. The silver coin may be purchased separately. Approved by Buckingham Palace the obverse of each coin carries a fine effigy of Her Majesty Queen Elizabeth II by Ian Rank-Broadley FRBS FSNAD. 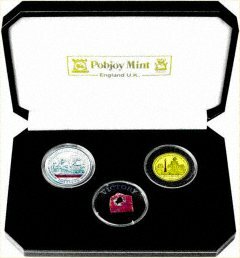 Each coin has been struck four times to achieve the illustrious Pobjoy finish. For British Virgin Islands coins in silver or base metal, or British Virgin Islands coin sets other than gold, please look at the British Virgin Islands Coins page of our original website.